This homemade costume for families entered our 2016 Halloween Costume Contest. Our son, pictured in the middle, loves both Hotel Transylvania movies. This year we did him a favor! His father, pictured on the far left, is dressed as Johhnystein from the first movie. 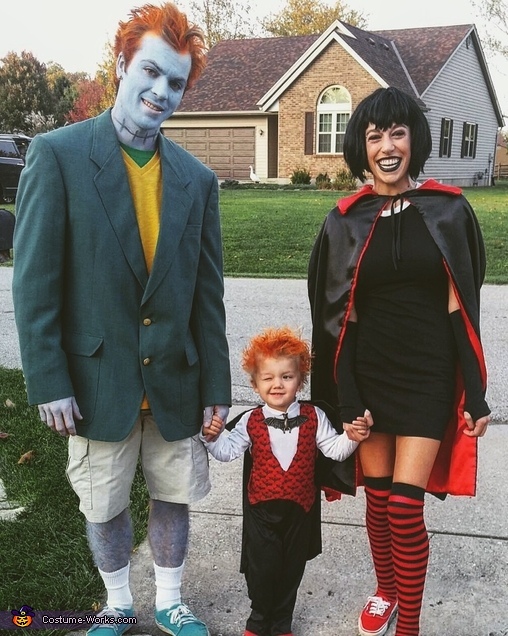 Chasen, our son, is dressed as Dennisovich(Dennis) Dracula from the second movie(pictured in the middle). I am pictured on the far right dressed as Mavis Dracula. We had a lot of fun playing dress up! The face makeup, colored hair spray, and the make over of his wagon into a scary vampire coffin make this quite the art project but also made our Halloween extra fun this year! I hope you all enjoy our costumes as much our neighborhood did!